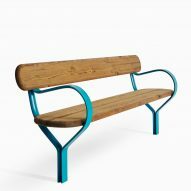 Dezeen promotion: Vestre has collaborated with Swedish design studio Front to create a modern outdoor furniture collection informed by Nordic cities. 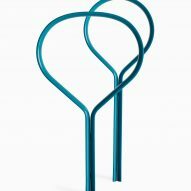 Named Folk, the collection was launched at Stockholm Design Week 2019 when Vestre and Front joined Dezeen to discuss the role of urban furniture in creating an atmosphere of social cohesion. 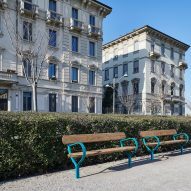 The range comprises of park benches, litter bins and bicycle parking racks, informed by Nordic outdoor furniture that is "found everywhere, often becoming a natural part of the park or sidewalk". 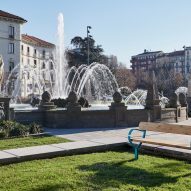 "We started looking at all the outdoor furniture we encountered on our travels and various other references – analysing all the different kinds was inspiring," said Front cofounder Sofia Lagerkvist. "Vestre's furniture is high quality, with long lifecycles, so, we quite quickly came to the decision to create a classic and timeless series, perfect for today and tomorrow, and for urban and close-to-nature environments." 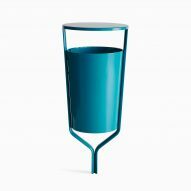 The Folk collection makes use of Vestre's trademark modern and at times futuristic forms. 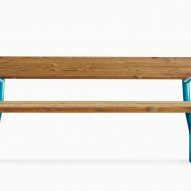 Each piece is made with Swedish pine and aluminium produced by energy company Norwegian Hydro, which boasts the world's lowest CO2 emissions. The pine used in the collection is treated with linseed oil, encouraging it to turn a more silver grey over time. 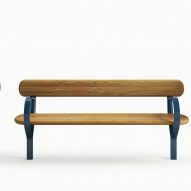 "We drew inspiration from the iconic green park bench found all over Stockholm – a bench that doesn't take over but rather blends in with, complements, and becomes a natural part of its surroundings, regardless if you are in an urban space or out in nature," said Anna Lindgren, who is also cofounder of Front. 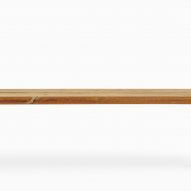 "The design concept sprouted from the idea that the wood should hang free in the metal form, keeping the load points down to two," added Lagerkvist. 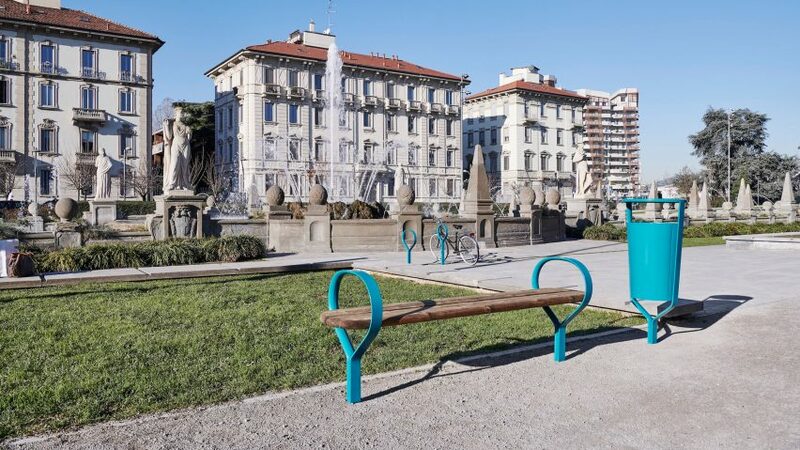 "Visually, the bench consists of two different materials and three simple elements." 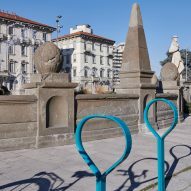 The bicycle racks feature the same looped detail, while the litter bins have an equally minimal aesthetic, featuring a container that slots into a simple frame. 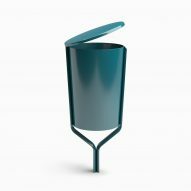 Each piece is complete with slender legs that allow lawn mowers to easily move around and beside them. 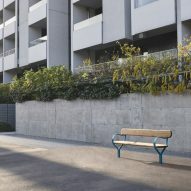 Vestre is a leading manufacturer of outdoor furniture, which has been involved in creating "sustainable social meeting places" for almost 70 years. 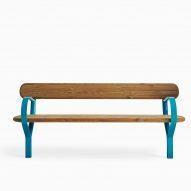 The products are manufactured in Norway and Sweden, and are available almost 200 different colours with a lifetime guarantee against rust. Find out more about the collection on the brand's website.